It is always exciting when a favourite author has a new book on the way, but even more so when there are two. I'm referring to Jacqueline Carey, author of the tremendous Kushiel's saga. 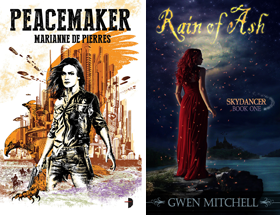 Jacqueline has not one, but two new books coming out this spring beginning with Santa Olivia in May and Naamah's Kiss in June, the start of a new Kushiel sequence. 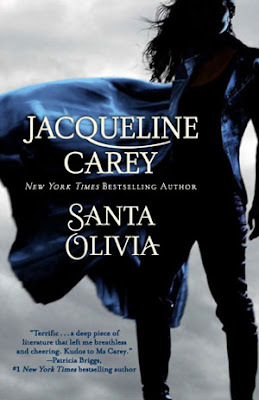 Santa Olivia is Jacqueline Carey's take on comic book superheroes and the classic werewolf myth. Sounds like a wonderful urban fantasy hybrid. Loup Garron was born and raised in Santa Olivia, an isolated, disenfranchised town next to a US military base inside a DMZ buffer zone between Texas and Mexico. A fugitive "Wolf-Man" who had a love affair with a local woman, Loup's father was one of a group of men genetically-manipulated and used by the US government as a weapon. The "Wolf-Men" were engineered to have superhuman strength, speed, sensory capability, stamina, and a total lack of fear, and Loup, named for and sharing her father's wolf-like qualities, is marked as an outsider. After her mother dies, Loup goes to live among the misfit orphans at the parish church, where they seethe from the injustices visited upon the locals by the soldiers. Eventually, the orphans find an outlet for their frustrations: They form a vigilante group to support Loup Garron who, costumed as their patron saint, Santa Olivia, uses her special abilities to avenge the town. Aware that she could lose her freedom, and possibly her life, Loup is determined to fight to redress the wrongs her community has suffered. And like the reincarnation of their patron saint, she will bring hope to all of Santa Olivia. Looks Good! I'm not a big fan of her other stuff because she writes lyrically, if that's even a word. This book looks promising ofr me though. Interesting. I keep hearing about Carey, I even managed to snag a three Kushiel novels from bookmooch, but I haven't tried her yet. It sounds like I better soon though. Princess Allie, being an urban fantasy superhero crossover I wonder if Santa Olivia it will have a similar flavour to Vicki Petterssons Zodiac series. Hi Jackie I am really interestedin this book because I am surprised she os trying her hand at UF. Her Kushiel books are on my Top 10 list of best fantasy series of all time. I am constantly recommending them to friends. OH MY GOD I HAD NO IDEA ABOUT THE SANTA OLIVIA!!!!! I think I just had a happy heart attack. THANK YOU for the scoop, Sci-Fi Guy!!!!! I adore Jacqueline Carey's work. Her Kushiel series is probably my second favorite series of all time, regardless of genre. And now she's going to write in the Urban Fantasy realm?! Be still, my heart! You are more then welcome Thea. Carey is one of my all time favourites as well. I have been blessed with an ARC of the book and will share my thoughts with you once I am done. Probably won't post the review for awhile though given the May release date. You can't see it, but I'm glowing green with envy right now :) Cannot wait to see what you think of the book. It's already an auto-buy for me! Thea I promise not to tease. Wow, this sounds like fun. Is it a standalone, do you know, or part of a series? Hi Darla I just finished reading this last night and all I can say is WOW! Carey ties up the story nicely but I do see the potential for a series but somehow doubt that that is the intention.